Below is the info I have gathered. I started looking through this list and found it difficult, at best, to find the exact same conditions that this city wants. I asked for info from just those who built their amphitheater with these key components in mind. Koodo's to The Huber Heights Courier. On Feb 13 they started to publish the Administration Committee agenda on their website. Post Meeting Notes added 20 Feb 2013: For the Feb 19th Administration / Public Works Committee meetings. Please Attend and Educate Yourself! How will the noise affect the area? Find out the location of the Music Center. What will it do to traffic? Will it devalue our property? Will our taxes go up? Who’s paying the 18 mil & how will it affect us? I figure out how to get member posts to show up without my intervention. If you create a profile you can post to a lot of different sections of the site without me having to approve comments. Obviously, the desire is productive comments that will lead to better government. Everyone can post comments as a guest but I have to look at those first. Executive Session - School and City - When are they appropriate? The agenda for Monday's Council Meeting is posted on the city's website on the Meeting Information and Audio page Don't forget you can watch the meeting live over the internet (the link only works during the meeting) or you can watch a recording once it is posted a couple days after the meeting. Of course you can always go to city hall Monday night and participate. As the article title tells you council plans on appointing a new city manager. I realized the other day that there have been no committee discussions about possibly raising the income tax. The DDN tells us council was thinking about it. Council would have to vote at a council meeting to do this and it would have to be done prior to Feb 6th if they wanted it to appear on the May ballot. The only regularly scheduled council meeting before Feb 6th is on Jan 28th. I just got a call from Mindy Proctor and she told me Victoria's Italian Cuisine has committed to donate 10% of their Sunday proceeds in order to make sure Wayne High School students have the opportunity to participate in JROTC. The restaurant plans to continue this program until the newly formed foundation raises enough money to keep JROTC. Update: The council meeting was not useful in understanding the $600,000 loan from the Fire Capital Fund to the Fire Operating Fund. It was also not useful in understanding the accounting change. However, I broke down and made personal inquiries. As always the city staff and the council members were helpful and the one on one information was informative. But what good is it if only one person outside council knows "the reason" while the rest of the community has to guess? I received a call from the Board of Elections yesterday. The correct date for filing petitions to run for Mayor or City Council is Feb 6, 2013. I do not know why the date was moved 15 days earlier than the first date that was put out but I heard it may have been a calculation error by one of their employees (as opposed to the state moving the date). School Board Funding Workshop Sat Dec 8, 2012 at Studebaker. The school board and administration have been holding meetings trying to figure out what to do about the school budget shortfall. This is another event. It looks like we will find out structure and agenda items when we get there. Below is the meeting notice copied from the City Schools website. Again, it wasn't easy to find and does not appear on the calendar or upcoming events. This week it looks like the Public Works Committee is as interesting as the Administration Committee. Although without the pre-read that is sometimes attached on the city website it is hard to tell what will be discussed. 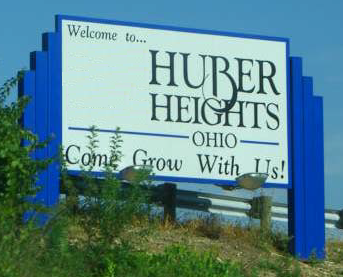 If anyone is interested in becoming Mayor, a member of city council or a school board member of Huber Heights, you must file your application prior to February 6, 2013 (updated filing date). There are 3 council positions and 3 school board positions available. 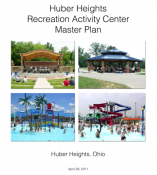 The application process for Mayor and City Council requires you file a nominating petition with at least 50 signatures and addresses of Huber Heights registered voters. 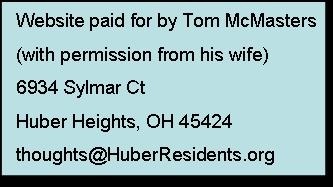 Wed at Huber Heights City Hall. See the city's website for agenda items. The posting below reflects the agenda as of 6pm Tuesday. Note: On the Agenda is the 2013 City Budget. Also, the YMCA is scheduled to talk about the Aquatic Center's financial report.